About More colored bottle shots, this time on film. Thank you for the kind words about my image. Unfortunately I have not been able to comment much or respond to comments or forum messages due to my current workload. Some day I hope to actually shoot some pictures again and enjoy myself. I am beginning to, make that I am past not liking computers, but they do pay the bills so I am stuck for a while. I most humbly apologize to you first in that I could not provide a better comment as you and then to the Author of this image Phil that he did not reply to my critique at all, but I do love this image quite a bit with it's beautiful placid abstract colours! Splendid colors and composition, Philip! Congratulations for the award! Stunning image, dear Phillip. Congratulations on well deserved BIP award! Send me the SBCC date-time-place info (E-Mail in my bio) when you come across it. I have MANY events planned this month but I am interested and would like to squeeze it in if possible. thanks for the invite. PS: Thanks for the set-up link. Doyle, thanks for the comments. I actually shot a whole bunch of pictures with these little bottles. All sorts of colors and positions, even a few clear ones. All on transparency film even no digital. The chromes look amazing, the scan does not do them justice. I bought these bottles at Michaels for a few dollars each and bought a whole bunch of them just to use for photos. I also love to shoot bottles and glass. If you go to my site you can see the setup used for this image. http://www.pwcphoto.com/Sets/Colored_Bottles/colored-bottle-set.htm you might find it interesting. Also the SBCC will be having its first meeting sometime in August, will keep you informed, hope you will attend. Kinda' neat Phil . . . lucky for the new project so I could find this one . . . I think the extra space around might have helped (as mentioned) but really my thought was this is good as is . . . and I love the little bottles . . . I collect colored bottles and a long time ago had small ones like this. The only thing I would have done differently (and I would have to do it . . . look at it . . . and then decide if it works or not so you may have done this already) is to use a different sequence based on color and not bottle shape. Placement of the green, for example, between the yellow and the blue as nature's spectrum would have placed it. Still . . . I'd have to see it, not just visualize it. And still . . . this is a great image. eh eh eh.. is a moment for to see also your old shot..
3. Should we have just a tiny bit more clearnace all the way around? I think so ...How about you? Thanks for sharing from long ago and Best of Regards! A stunning image, Phillip! Fabulous colours and comp! Congratulations on being the first photo in the project and the first BIP! Well done! The whole series is wonderful! I see it at home now as I had seen it at work. Both are PCs. Halo or no, it's a very nicely set up, carefully executed image. This and its sisters make a fine series. Inspirational to those of us who want to know what we can do with photography, Phil. Thanks! just to add to the halo/no halo discussion, I see exactly what adam sees both on this and on the one on your site (I'm on a Mac at the moment, but just to check will look on my PC at work on Monday! Hi Phillip (I had to double-check that your name has two "l"s). On the full-size one I see what Mary Sue described. Kind of a white area with some blue dots. It looks like some Photoshop cloning with a soft brush and just clicking without dragging the brush as the spots look like soft circles. It also looks like some clean-up around that area in the background. My suspicion is that what we're describing is a difference between viewing on a Macintosh (which I'm using) and on a Windows system. Sometimes the gamma setting on Macs shows things you can't see on PCs (and vice versa -- don't want to go there). So, my educated guess is that Sue, Mary Sue, and I are on Macs and you, Beverly, and most everyone else are on PCs. Of course, if that's not the case, my theory is wrong. If you use Photoshop, you can view your image using a different gamma setting (in the "Proof Setup" menu under "View") though I didn't see much difference in the "halo effect" when I tried it. Hope this helps. As with Mary Sue, I love this image. I looked at the full size image you linked to, and the halo is not visible there for me...except for this narrow diagonal line that goes across the neck of the bottle in the same place where the halo is on this image. I never would have noticed this if Adam had not seen it first. THis isn't a criticism, I really love this shot. Perhaps it is part of the jpg compression, here is the full size version on my web site. Please take a look and let me know if you still see it. I see it too on a ViewSonic flat screen. I didn't see it at first, but when I raised up just a little bit, it jumped out. I scrolled the image up and down to make sure it wasn't just a weird spot on my monitor, and the halo moved along with the bottle. It isn't present on the other bottles though. Perhaps evidence of poltergeists? He's right. I see it too. Hmmm. Now that I'm looking at it on my main system (Trinitron CRT) I still see it. Right between the handle and the lip of the blue bottle. Weird. I thought it was some flare from a light at first. Adam, I suspect it is an artifact on your LCD screen, I don't see it on mine. It could also have been caused by the JPG compression program on the server as the original image was re-sized. It was a bit larger then you see here. What's the halo around the neck of the blue bottle? Or is it an artifact of my LCD screen? A very fine work of art. I wouldn't mind having this on my wall! Terrific idea, terrific color. Great bottles! This is amazing! I too prefer this to the other. The extra yellow and the composition add interest and even some depth in my opinion. Wow, great job! Lass, thanks for the comments. 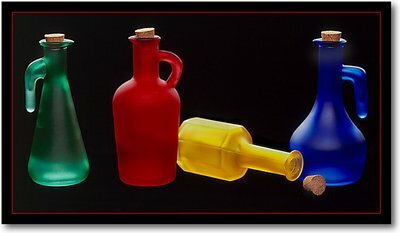 I created a page showing the set up for shooting the bottles. It looks more complicated then it really is, it is basically 2 lights, one in front and one from behind with some black foam core boards to shield the camera from the bright lights. Here is the link to the page. wow! i like this one better than the non conformist..of course..i am a sucker for bright colours...wish there was more space between them, tho..looks a tad crowded...but really.WOW...how was this lit? Needless to say how beautiful is this pict.